Wilfired Zaha has been told by Cardiff boss Ole Gunnar Solskjaer to celebrate if he scores against his former club Crystal Palace. Cardiff are five points behind 16th placed Palace in 18th in the Premier League. Solskjaer says there is no room for sentiment from the on loan Manchester United winger if he finds the net. "I've told Wilf you're going to celebrate when you score," said Solskjaer. The Norwegian says reports linking Zaha to Palace this week have been manufactured ahead of a game which could be crucial to either side's hopes of Premier League survival. "We've had Wilf coming on making an impact and surprise, surprise, Palace would like to sign him this week," said Solskjaer. "This week it's come up because we are playing his old team. Palace is his history." Zaha, 21, has made just four starts since joining the Bluebirds in January. Since his move to Old Trafford, Zaha has started just two games, the Community Shield victory over Wigan and the League Cup fourth-round win against Norwich. Signed by Sir Alex Ferguson, his only league appearances under David Moyes have come as a substitute against Newcastle and Aston Villa in December. 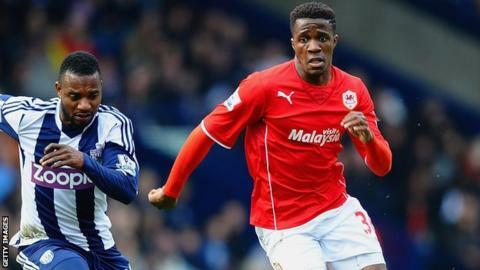 But Zaha came on in Cardiff's dramatic 3-3 draw against relegation rivals West Brom last Saturday. He played a key role in the comeback, providing the cross which eventually resulted in Mats Moller Daehli's 95th minute equaliser. Solskjaer says the United wide-man will feature against the Eagles in a game he says the Bluebirds have to win. "Wilf will play, don't worry," said Solskjaer. "I don't think they [Palace] are looking forward to seeing him running at them. So he'll be on the pitch. "We need to go out there and give it a go and do what we can to get those three points."